Brrrr! I don’t know about you, but I’m reeaaalllly ready for spring, which is too bad, because it’s only January. We still have another month of winter darkness to go. I know this will sound odd, but the fact that all my critters are shedding like crazy is something of a comfort, since it means that the days are truly starting to get longer (despite the fact that they don’t seem to be). After all the marathon knitting that I did over the past few weeks, this week has been comparatively unproductive. 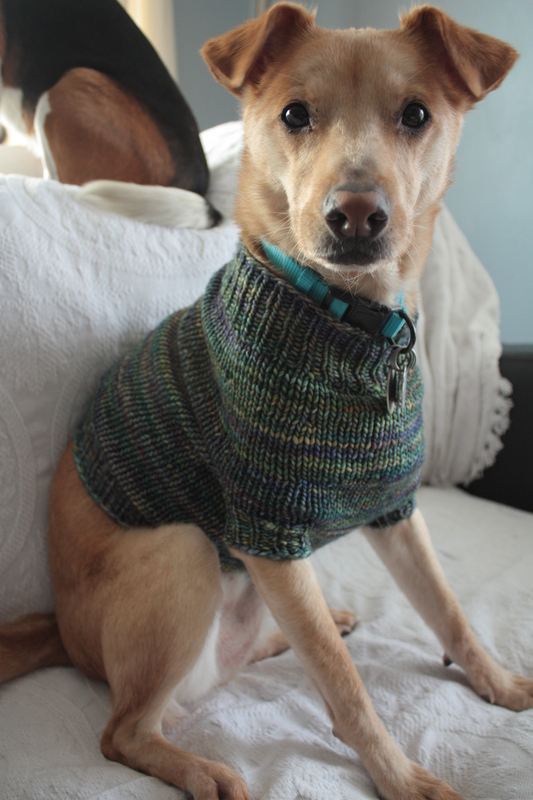 I did manage to finish Teddy’s sweater…. 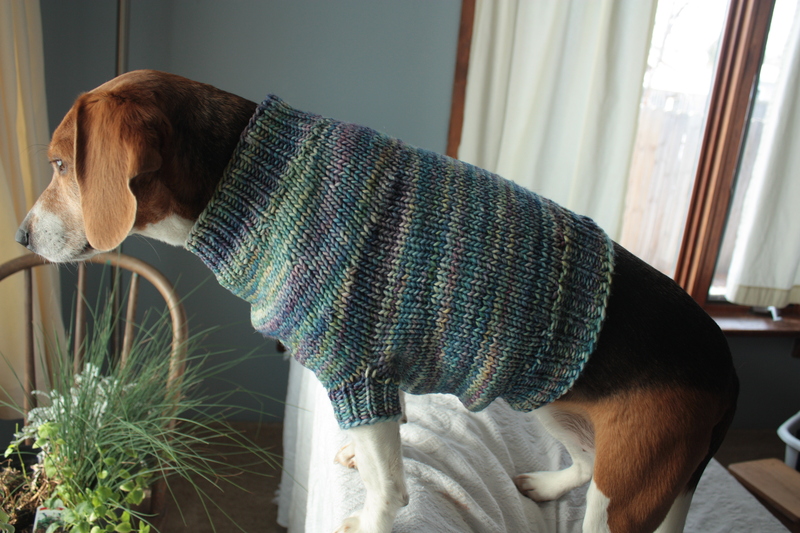 And here is Molly’s sweater…. (Yarn is Malabrigo Mecha in Arapey.) Believe it or not, the two sweaters are exactly the same (except for color, of course). I find it both funny and fortuitous that both dogs wear the same size, even though their body types are radically different. At least when we take them out in the wee hours of the morning (with bleary eyes and minimal lighting), we don’t have to worry about somebody getting stuck in somebody else’s sweater. Getting back to knitting, I’ve started my January Dream Club…. The pattern this time is Blue Jean Boheme, and the yarn is Jilly with Cashmere. This is going to be the right-hand mitt. For those of you who are unfamiliar with the Dream Club, it’s a club that Dream in Color offers to yarn stores. Each month’s kit consists of a pattern and a skein (sometimes two skeins) of yarn, dyed in a special, never-to-be-repeated colorway. Part of the fun is that quantities are limited, as each yarn store has to request their monthly quantity at the beginning of the season. Once they’re gone, they’re gone. The patterns eventually go up for sale on Ravelry, but the colors won’t be available again. I always buy my Dream Clubs here. This is usually the point in the season that I fall behind with my Dream Club knitting, but I’m determined to keep up this year, by hook or by crook! You can imagine my chagrin, then, when I discovered Molly tearing into my freshly-wound cake of yarn two nights ago. I had just put a good start in on my mitt when I caught her trying to pull the guts out of the cake. She was having a grand old time, but my reaction was vehement nonetheless; you have to nip this sort of thing in the bud. In all fairness, to her it probably looked a lot like the plush balls that we give her and Teddy to play with; and she really didn’t hurt it–just tangled it up a bit. At any rate, I’m having to be much more careful about leaving my knitting lying around, which is probably a good thing in the long run. Well, that’s all I have for this week. Here’s hoping for some warmer weather soon (above 10ºF would be really nice). Until next time, take care and happy knitting! You have the best dressed dogs in the city! Lovely colors and aren’t you lucky they both wear the same size…VERY convenient! 🙂 Stay warm! I don’t miss that cold up there, but we are getting a taste of that right now. Dripping the water faucets and broke out the space heater! Think Spring!!! No kidding! I have a little yarn left over. 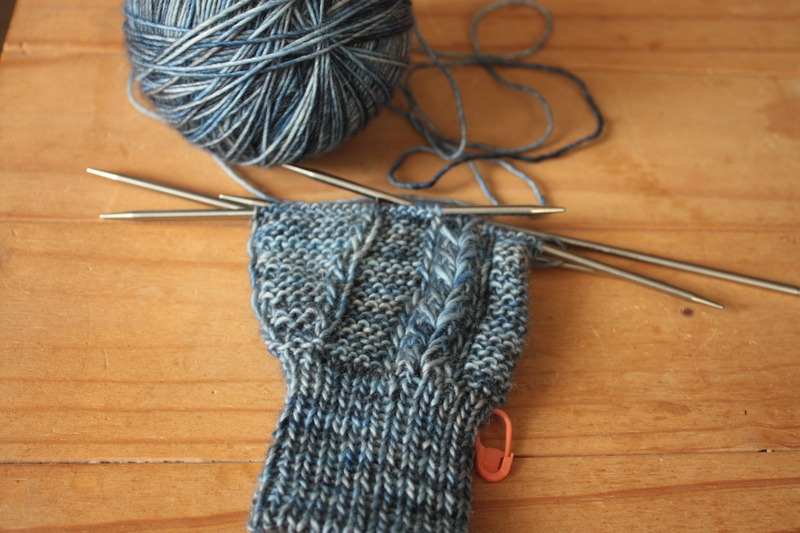 I’m thinking about making them some legwarmers….